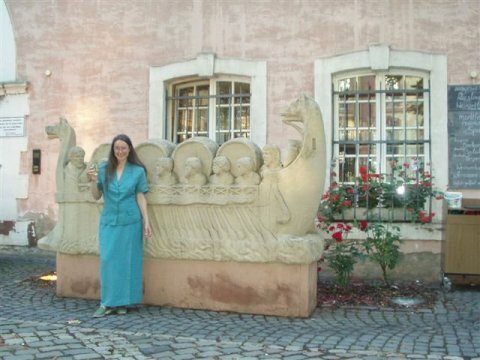 In 2005, Paul and Louisa joined the Hadrianic Society’s Study Tour of Roman Germany. Louisa is seen here in Trier, at one time capital of the western Roman Empire and so the seat of government for the provinces of Britain. Louisa is sampling the principal export of the area. Wine beakers from the Trier region are found at Roman forts, such as Binchester, in the north of England, showing trade contact between the two areas. Wool from Britain may have been traded in exchange for wine.